A certain, lesser-known kind of marijuana can help you lose weight. It can even help you stay slim, too. I'm serious -- even though some readers presumably think I must be smoking something funny to make such a seemingly crazy claim. After all, pot is known for stimulating the appetite -- commonly known as "getting the munchies" -- and encouraging cravings for unhealthy carbohydrates like potato chips or cookies. Dried marijuana and green capsules. A certain, lesser-known kind of marijuana can help you lose weight. It can even help you stay slim, too. I'm serious -- even though some readers presumably think I must be smoking something funny to make such a seemingly crazy claim. After all, pot is known for stimulating the appetite -- commonly known as "getting the munchies"- and encouraging cravings for unhealthy carbohydrates like potato chips or cookies. But misconceptions about cannabis still abound. First of all, it won't cause you to frequently over-eat and pack on the pounds. On the contrary. Science is now revealing that it can actually help you shed unwanted flab without even breaking a sweat. Here's a big problem that we all face: Losing weight is hard to do if we're stressed. Truth be told, our fast-paced modern-day lives subject us to too much stress. Unfortunately, we're just not hard-wired to deal with constant pressure. This is why it can negatively impact our health in a multitude of different ways, which I discussed in a previous Huffington Post blog. At the very least, stress can promote weight gain. It can also interfere with your efforts to lose unwanted pounds, particularly around your waistline. That's why exercise isn't always very effective. How does this happen? Blame it on the stress hormone, cortisol. Our bodies' production of cortisol is part of our evolutionary reaction to perceived danger, which is commonly known as the "fight or flight response". When this kicks-in, your body is flooded with cortisol to raise your blood pressure. In turn, this enhances the flow of oxygenate your muscles and brain -- hyper-energizing you to react to any real or imagined threat. The problem is that every-day stressors tend to trigger this physiological reaction all too often. And when stress is unrelenting, your body is likely to respond -- even without you realizing it -- by going into survival mode. This causes your body to hoard fat and burn fewer calories than normal. Why is this? It's merely a biological defense mechanism against famine -- a seriously stress-inducing threat to humankind that was commonplace until a few decades ago. So unless for instance you're starving to death or being chased by a grizzly bear, cortisol isn't your friend. Remember, it's a fat-hoarding hormone. So you need to keep it in-check. You can minimize your body's production of cortisol by simply by learning to relax. And if you need a little help doing this, medical marijuana could become your new best friend. Especially if it can shrink your waistline in the process. However, there's a catch: For many people, cannabis can actually induce stress, temporary paranoia and/or even panic attacks. This is due to the presence of cannabis' most renowned chemical - THC. This is what causes the chilled-out, mildly euphoric feeling that most people experience with marijuana. In other words, it's the psychoactive agent in pot that makes you feel "stoned". Unfortunately, the recreational cannabis culture has traditionally promoted the notion that the stronger cannabis is, the better it is. That translates into lots of THC. Instead, plenty of people would rather enjoy the relaxing benefits of cannabis without any cognitive impairment. This helps explain the newly-found popularity of CBD-rich strains of cannabis, which chill you out without getting you high. 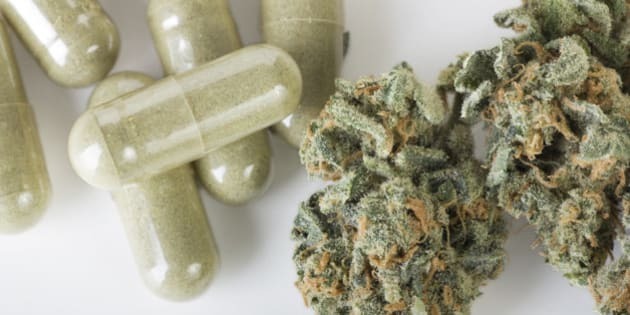 For more on CBD's medicinal powers and growing popularity, check out my past Huffington Post blog on this topic. What's particularly remarkable about CBD (aka cannabidiol) is that it significantly reduces the stress-increasing effect of the THC in cannabis. That's really important if you want to trim down because THC can actually raise your cortisol levels, even if it doesn't induce any anxiety. In fact, CBD has the exact opposite effect to THC in that it lowers your cortisol levels, thereby making it easier for you to lose weight and to keep it off. As previously mentioned, this will make your metabolism more efficient by allowing you to burn more flab, particularly around your middle. As proof of CBD's fat-fighting powers, it has even been shown to reduce obesity in animal studies. Also, laboratory rodents that were administered CBD while on a calorie-restricted diet lost more weight than their counterparts in a control group. Strains of pot that are high in CBD but very low in THC are a relatively new phenomenon. They first came to prominence with the cultivation of "Charlotte's Web" -- a unique strain of non-psychoactive cannabis that is highly effective at medicating children with certain seizure disorders. By the way, kids don't smoke it; it's orally administered to them as an oil in a paste. Now CBD-rich strains of cannabis have found a new market. They're fast becoming popular with stressed-out adults who don't want to get "high" as they go about their busy days. If you're someone who could benefit from this too, even if it's just to slim down, then here's what you can do: visit your local medical marijuana dispensary or get a doctor's prescription to buy from a federal-government-approved "licensed producer". Bear in mind, however, that there are different ways to ingest cannabis. By smoking it, you will enjoy its calming, relaxing effects almost immediately. Alternatively, you can consume CBD-rich cannabis as an oil that you can infuse into foods (or purchase as a pre-packaged CBD-infused food product from a dispensary). Even though oral consumption of cannabis usually takes 30-60 minutes to take effect, it tends to have a much longer-lasting effect than smoking does. And it's easier on your lungs. Whatever your preference, it's a great way to de-stress while also burning calories with optimal efficiency. In other words, you'll discover how to chill your way to a leaner, fitter, and ultimately happier version of yourself.